Seeing as BeautyMecca is all about lashes this week, I have another mascara to throw into the mix. I got a press sample of Clinique’s Lash Power a few weeks ago and I am seriously loving it. It lengthens and separates without any clumps, for very pretty lashes. BUT the best bit… it does NOT budge… at all. Until you want it to, that is. You don’t need eye make-up remover to take it off. Just a little bit of warm water, some gentle massaging and it comes off, without panda eyes. It is just brilliant. 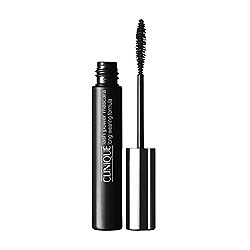 I have tried the Blinc mascara that has the same removable qualities and I loved that too, but sorry Blinc, Clinique has bettered your wand – it is just a better size and shape for lengthening. When this sample has run out I will be off to Clinique for another. And as I generally change my mascara brand every time I buy a new mascara, this is a big compliment. And it’s only £15. They say: Vows to look pretty for 24 hours without a smudge or smear. One stroke and these pretty lashes last through rain, sweat, humidity, tears. Yet the formula removes easily with warm water. Unique brush reaches and beautifully lengthens even the tiniest of lashes. Ophthalmologist tested, too. I’m all over Clinique at the moment. Between the Chubby Sticks and the Long Last Glosswear (in Juicy Apple in case you were wondering) I’m having a bit of a love in. Previous Article>Elemis FreshSkin Competition + TSGTDL Giveaway!